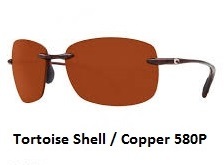 Destin - Tortoise Shell - 580P Copper Polycarbonate Lens £159.00 Sale Price £139.00 LAST PAIR! Named after Destin, Florida, where the beaches are pretty much heaven on earth, Costa Del Mar’s Destin sunglasses deliver lightweight, rimless frames that will keep you comfortable and relaxed all day long. Whether you’re soaking up the sun on a white sanding beach or sitting on your front porch pretending like you are, you’re going to look and feel good in a new pair of Costa Del Mar Destin sunglasses.